Changes in land use and land cover have various impacts on the water resources available in the ecosystem. For effective watershed management, it is crucial to understand the impacts of the former on the latter. However, multiple factors make this difficult and can limit the usefulness of hydrologic analysis when developing and implementing environmental policies. For example, it is not always easy to make assessments across varying temporal and spatial scales, and multiple sources of uncertainty may be inherent in the analysis. 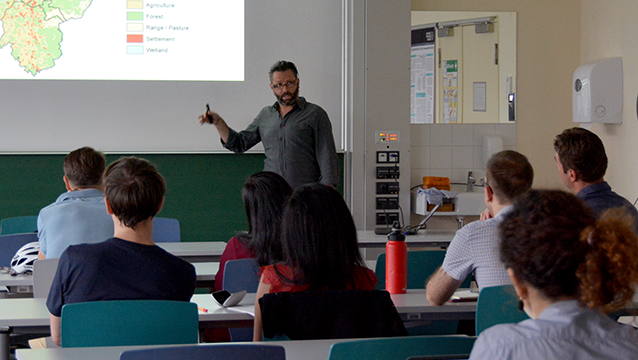 In his lecture on “Multi-Scale Assessment and Land-Use Dependent Valuation of Hydrologic Ecosystem Services” on 24 July 2017 at TU Dresden, researcher Daniel Hawtree (Institute of Soil Science and Site Ecology, TU Dresden) discussed the relevance of several analysis methods in order to address these challenges, such as the Soil and Water Assessment Tool (SWAT). 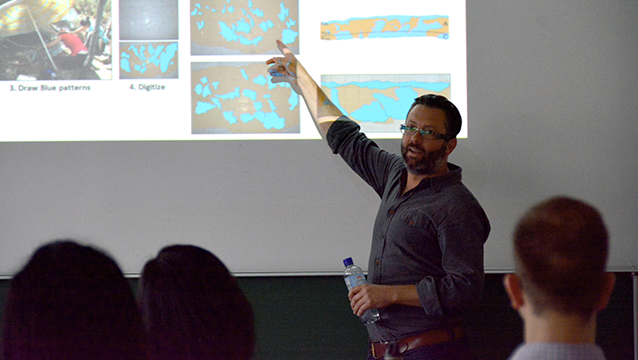 Delivered as part of the joint Nexus Seminar Series between UNU-FLORES and TU Dresden, the lecture provided insight into land-use dependent valuation of hydrologic ecosystem services. Hawtree presented some of the state-of-the-art analysis methods by looking at their application in a case study in the Vouga Basin, Portugal. In this study, he assesses the impacts of forest-related land-cover changes on water resources. Hawtree began by presenting the environmental and geographic setting of the region of the Vouga Basin in Portugal. Heavily forested, the region has undergone substantial land-cover change in the twentieth century and registers one of the most polluted waters in Europe. This is in part due to agriculture in the South of Portugal. This pollution causes major health and food problems for the local human population. Addressing or avoiding problems like in the Vouga Basin depends on sustainable environmental planning. Such environmental planning requires predictions. While models will always provide an output, its quality is largely contingent on data quality. In order to address the challenge of data availability, Hawtree applied a four-step trend-testing methodology. He went further and discussed the application of SWAT, a “small watershed to river basin-scale model to simulate the quality and quantity of surface and ground water and predict the environmental impact of land use, land management practices, and climate change”. It is widely used in assessing non-point source pollution control and regional management in watersheds. Based on several simulations, he derived best management practices targeted at improving the state of water resources in the basin. While practices such as reduction of nitrogen and fertiliser inputs benefit water-quality management, these practices are double-edged for the producers. There are financial costs involved with the reduction in yields and the loss of productive lands. Hawtree also highlighted the need for a multidisciplinary approach towards making an end-to-end assessment of environmental impacts. The costs analysed by a hydrologist need not necessarily match up to those by an economist. The afternoon lecture culminated with a lively Q&A discussion, during which it was concluded that transdisciplinary thinking behind scientific models is crucial for scientific results to become useful for policymaking and in stakeholder interaction. This Nexus Seminar No. 22 was the concluding seminar of the series for the summer semester. UNU-FLORES and TU Dresden will again be joining forces to deliver thought-provoking lectures and rigorous discussions on the Nexus Approach to environmental resources management in the 2017 winter semester. Please look for information on the winter semester line-up in the coming weeks.